Just to see is to believe, here is the introduction of Icy Land and welcome to Kachin State of Myanmar! Actually, the wonderful trip starts in Kachin State, Myanmar's northernmost state with borders of India and China to the north and east. The region possesses a wealth of unspoiled nature, hilly mountains, precious resources and memorial places of war veterans. Major mighty rivers; Malihka, Mehka, Tanainghka and Ayeyarwady which is the main artery of Myanmar, flow from the north to the south. 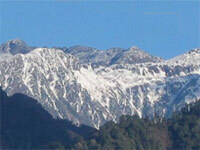 Kachin State occupies most hilly snowy regions, descendent from eastern Himalayan. People living in Kachin State are of Tibeto-Burman origin, representing four main groups; Jinghpaw, Maru, Yawyin and Lisu. Each has each own language and culture. Most Kachin people are Christian, but some with the old beliefs practised syncretically. Not only Kachin, but also Rawan, Lashi, Lisu, Shan, Bamar, Tai Hkamti and last remaining member of the Tarong tribe can also be found. Agriculture is just the main business and timber, the second, for survival in Kachin. Shifting cultivation still prevails in the hills. The famous and largest Jade-mining centre, too, is situated in Hpakant of Kachin State. The trip further north to Putao needs special permit. There is daily train between Mandalay and Myitkyina that takes somewhere 24 to 30 hours to terminate the trip. But, the best way to the state is to take flight to Myitkyina and continue the destiny by car, boat or trek. Myanmar Airways (UB) and Air Bagan flies to such region. Over 3800m of snow-capped mountains separate Myanmar's Kachin State from Arunachal Pradesh in India. It's easy to trek from Putao, the center of eco-tour, only 61 miles to the summit. The snowcapped summit provides long days of hard trek, but the views west to India and east to the Putao valley in Myanmar, a truly spectacular. The most picturesque treks include the combination of tribal villages, dense subtropical forest and the icy snowy mountains. Different routes lead to the track of mountains for up and down, and in such way, nature inspires those who like trekking. The ecosystem of this region is wonderfully unique and it's almost untouched unless desire with enthusiasm. So why don't you take a risk to a marvelous Phonkanrazi? A Wonderful Myitson is the confluence of the Mehka and Malihka rivers, 43km north of Myitkyina. Mighty Ayeyarwady River beautifully starts by here. Visiting Myitson makes one feel the essence of Kachin, indeed. So, what a marvelous view to feel at Myitson! Myitkyina the capital of Kachin state, is often visited by world-travelers. For where and around there, as in Indaw and Panbaw, most allied soldiers sacrificed their lives. Such point has been mainly attracting the world. Putao is the town in far north area, 1169 miles away from Yangon, 457m above sea-level. It's also the centre or the starting point for those eco-tourists who like challenge to snow capped icy mountains of Kachin. The British called it Fort Hertz during WWII as being the base camp. The major village, Machanbaw is just 19-km away from Putao, connected by 211m long Malikha suspension bridge. And next to Machanbaw is the Mulashedi village, 10km away and connected with another suspension bridge with fascinating view. Manaw Festival : A huge celebration and dance periodically and traditionally held to pay homage to the Jinghpaw nat (spirits). Several types of Manaw are held depending on the region and time of year. So, what a surprise to see and feel a kind of tradition! Take a risk and face nature towards satisfaction!